Vancouver, BC – Central City Brewers + Distillers is pleased to announce the upcoming grand opening of their brand new Red Racer Restaurant on Beatty Street in downtown Vancouver. The new restaurant will feature an authentic smoked barbecue inspired menu specializing in build-your-own-burgers unique to Central City, and 40 draught taps offering Central City craft beers as well as from other BC craft brewers.The highly anticipated public grand opening is slated for Friday, July 24 and is Central City’s first venture outside of their home base of Surrey, B.C. where their current Central City Brew Pub and state-of-the-art brewery are headquartered. Located at 871 Beatty Street in downtown Vancouver near BC Place and Rogers Arena, the new 4,800 square feet (446 square metres) Red Racer Restaurant on Beatty Street pays some homage to the iconic former Dix BBQ & Brewery, retaining some of its original brick and beam character, mosaic tilework and design. The new 200-seat restaurant features a modern Victorian steampunk motif with overstuffed leather and upholstered furniture, industrial lighting and design elements, including timeless leather barstools, natural hardwood, and oversized handmade wood tables made from BC willow trees. At the heart of the restaurant sits a prominent cherry wood foeder barrel where its sour beer will be aged. Anchoring the restaurant is a 38-foot long bar, serving 40 local craft beers on tap including 14 of Central City’s own Red Racer and limited release beers, Hopping Mad Cider, as well as some of the best beers from BC craft brewers. The restaurant also features wine taps, a wine wall, and bench seating in the lounge area. Devils on Horseback: Herbed goat cheese stuffed dates wrapped in crispy beer bacon and served hot with an IPA sauce. Quinoa Cobb V Salad: Black bean & roasted corn salsa, avocado, crumbled blue cheese, quinoa, sliced free range egg & mixed greens. Served with an avocado herb dressing & squash chips. The Zeus Burger: Lamb Patty, goat cheese, lamb bacon, tzatziki, roasted garlic, onion rings, fried egg, butter lettuce, vine ripe tomato. 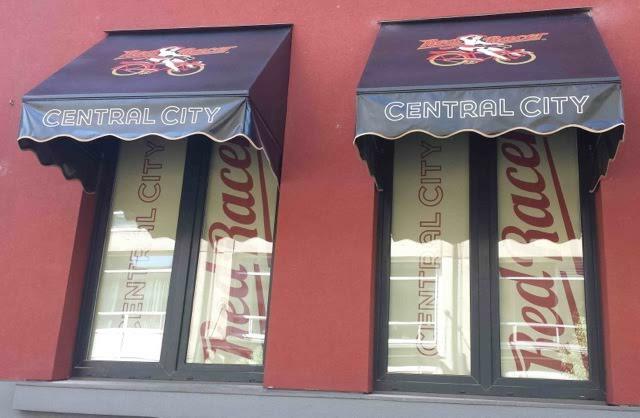 For more information on Central City’s Red Racer Restaurant on Beatty Street, visit www.centralcitybrewpub.com or @CentralCityPub on social media, hashtag #CentralCityBeatty.